With anything in this life if we sow sparingly then is our bounty small. 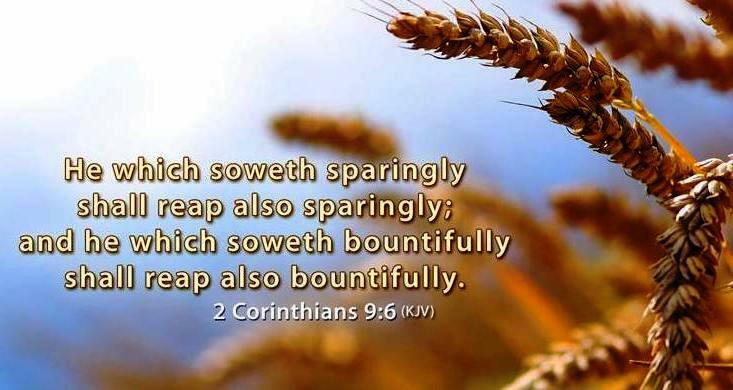 So it is with God and how abundantly we give to others, for God loves a cheerful giver (2 Corinthians 9:6-8), But this I say, He which soweth sparingly shall reap also sparingly; and he which soweth bountifully shall reap also bountifully. Every man according as he purposeth in his heart, so let him give; not grudgingly, or of necessity: for God loveth a cheerful giver. And God is able to make all grace abound toward you; that ye, always having all sufficiency in all things, may abound to every good work: (Proverbs 22:9). Spiritually if we sow more to the flesh we are at a loss in receiving the many blessings God has for us, but the wonderful gift of eternal life is ours if we sow to the spirit and not to the flesh(Galatians 6:7-10). Be not deceived; God is not mocked: for whatsoever a man soweth, that shall he also reap. For he that soweth to his flesh shall of the flesh reap corruption; but he that soweth to the Spirit shall of the Spirit reap life everlasting. And let us not be weary in well doing: for in due season we shall reap, if we faint not. As we have therefore opportunity, let us do good unto all men, especially unto them who are of the household of faith.